THERE’S FREQUENTLY a ‘loose cannon’ unpredictability and zanyism (or zhenyism?!) to the music of Russian-born saxophonist Zhenya Strigalev which is endearingly reminiscent of the great Roland Kirk – one only needs to take a look at the unfathomable naivety of his hand-scribbled sleeve art to this latest release, Robin Goodie, for an inkling. This is no stretch limousine of glossy, forgettable soft jazz, but rather an impassioned outpouring of the sax man’s quirky, raw, yet ultimately tuneful creations as composer and instrumentalist. 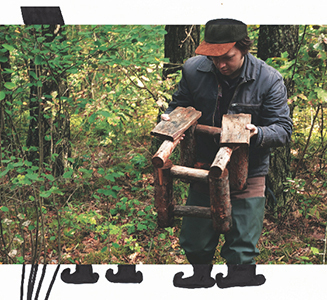 But don’t mistake any suggestion of apparently rough-hewn music for a lack of musicianship or inventiveness as, between them, he and his Smiling Organizm sextet serve up a programme of heady grooves, fervent ensemble playing and blistering improvisation. Joining Strigalev (on alto) is the illustrious team of Ambrose Akinmusire (trumpet), Taylor Eigsti (piano), Tim Lefebvre (electric bass), Larry Grenadier (double bass) and Eric Harland (drums). Strigalev says he is taken with the themes of “nature, humour, strong personalities, rebelliousness and stupidity” in the folklore tale of England’s heroic outlaw (Robin Hood and Boogie Woogie = Robin Goodie). Whatever his theory, these quoted characteristics certainly come to the fore in this second album, the leader’s desire for both acoustic and electric bass in this line-up producing a distinctly gritty edge to his eleven compositions. The capriciousness of this musical romp contributes significantly to its enjoyment – so not too many spoilers here. But the powerful punkiness of opener Kuku reveals much about the character of this band, Lefebvre’s high bass delivering a funk drive, combined with Grenadier’s acoustic, over which hard, mainstream horns (sounding like four not two) give it everything they’ve got… until they step up higher to outrageously frenetic solos. Horizontal Appreciation‘s piano and electric bass groove coaxes some terrific chops, not least the flamboyance of drummer Harland; and the comedic Sharp Night (shades of Yakety Sax) rattles along at an astonishing pace, unison phrases, bass electronics and Strigalev’s superb squawkings doing nothing to dispel that Kirk notion – fabulous fun to listen to and, no doubt, to play. It’s not all bustle and brashness, as Urgent Ballad (despite its oxymoronic title) provides the space for more reflective alto and double bass extemporisation; but you can’t keep these guys down for long, as the brilliant combination of complex, wacky grooves and high-flying straightahead jazz in closing Renduta takes off – and with so much going on here, it’s a shame for it to finally peter out (perhaps not so soon in a live setting). Released on 2 February 2015, Robin Goodie is available from Whirlwind. Currently in his mid-twenties, London-born electric guitarist, composer and sound engineer Leo Appleyard has already enjoyed an active and varied start to his career, frequently appearing at major UK and international venues and festivals. Now, recording with long-time colleagues and mentors Duncan Eagles (tenor sax), Max Luthert (bass) and Eric Ford (drums) – trio Partikel in another guise – and guest Neil Yates (trumpet, flugelhorn), Appleyard has created a bustling sequence of originals for quartet/quintet which genuinely capture the imagination. 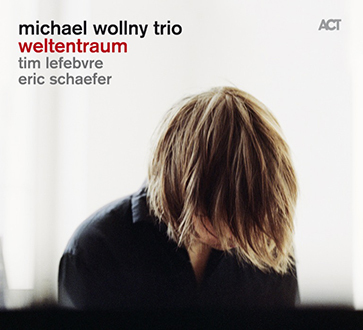 He has written specifically with these musicians in mind (judiciously employing echoes/effects) in the knowledge that the band’s collective understanding and affinity might produce improvisatory fireworks – and it’s not long (track 3, to be precise) before the full excitement and character of this set is emphatically ignited. The leader’s command of both chordal and solo dexterity (think Jez Franks, Kristian Borring) is introduced in curtain-raiser The Homeless Wizard, sharing unison lines with tenorist Eagles as well as duelling in improvisation. Appleyard isn’t afraid to switch tempi and mood (one of the joys of his writing), and Eric Ford’s solid, bright percussion bolsters the snappier sections. Trumpeter Neil Yates augments the line-up in Mass, its swooning, echoic horns gliding high above expectant, cinematic bass-and-drums impetus; and The Cleaver excellently showcases the accomplished soloing creativity of both Appleyard and Yates, the swinging verve of this extended piece becoming increasingly infectious, including an effective udu touch from Ford. Anywhere South sparkles confidently – a real winner of a quartet number which, again, indicates Appleyard’s compositional maturity, tempering its high energy with brief reflections (walk into a jazz bar with this at full tilt, and you’d be hooked); guitar soloing here is exceptional, both in terms of pace and inventiveness. The contrasting, subtle blues tranquillity of Mantra is tangible, Eagles’ gorgeously mellow tenor weaving lazily in and out of exquisitely-coloured guitar chords; and title number Pembroke Road (a reference to the tucked-away Welsh studio which gave birth to this recording) is an assured full quintet episode, gleaming with individual extemporisation and radiating an openness which perhaps reflects the influence of that rural Pembrokeshire landscape. The pliant strings of bassist Max Luthert announce Walsio, a breezy, carefree gambol with the occasional, intriguing hint of reservation. Appleyard’s desire for an initial theme of childlike simplicity is evident, though the quartet soon enhances this with pleasing rhythmic and harmonic divergence. Familiar Victor Schertzinger standard I Remember You closes the set – couched in soft watercolour impressionism, its miniature status certainly creates the desire for more. 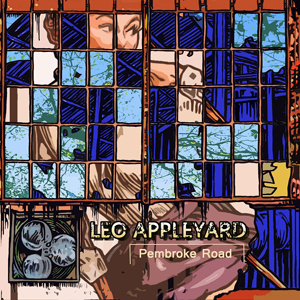 Partisans guitar supremo (and former tutor) Phil Robson concisely sums up Appleyard’s aptitude and future potential: “Leo is a fab guitarist and composer, definitely a real natural! This debut CD should firmly establish him as a new voice on the scene.” On the strength of these performances, it’s easy to concur. Pembroke Road is issued on the F-IRE label and available from Proper Music. BALANCE IS EVERYTHING… and this fine debut album, Next Beginning, from young London saxophonist and composer Samuel Eagles and his quartet achieves that assured, measured clarity and cohesion. Tutored and mentored by jazz sax illuminati including Mornington Lockett, Jason Yarde, Mark Lockheart and Jean Toussaint, this release suggests Eagles has got what it takes, both as an instrumentalist and writer, to make a big splash on the contemporary jazz scene. 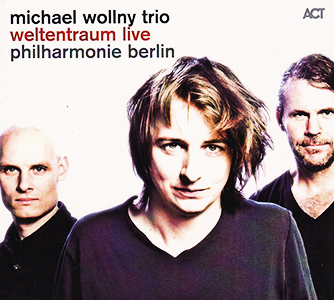 Joining him are Ralph Wyld (vibes), Fergus Ireland (double bass) and Eric Ford (drums) in an insouciant programme of originals which, laudibly, have been developed and honed on the live circuit before committing them to the recording studio – perhaps this explains the extended nature of all eight numbers here, importantly affording time and space for uninhibited improvisation. Declaring Stateside influences such as Logan Richardson and Ambrose Akinmusire, the quartet’s style is wholly accessible, revealing an empathy – and a certain warmth – which comes from strongly-forged musical bonds. Key to the band’s openness is the vibraphone limpidity of Ralph Wyld, demonstrated in ten-minute opener Remembering Myself which, with weightless bass and percussion, offers a sax tune so eloquent and amiable that it feels pleasingly familiar. The Place I Live swings apace to Eric Ford’s frisky, ricocheting drums and Fergus Ireland’s sprinting bass; the liquidity of Eagles’ extemporisations, gliding over this babbling momentum, are easily comparable to those of Jean Toussaint, or even Scott Hamilton – and again, Wyld sparkles, particularly in a trio episode with Ireland and Ford. The affable 50 Pound Friendship further displays the band’s parity in a glassy-smooth late-nighter; and Outsider rattles to Ford’s distinctive drum crispness, Eagles’ hard-edged rapid-fire riffs radiating an impressive maturity. Jason Yarde’s guidance is tangible in Samuel Eagles’ supple soprano prowess on Smells Like Summer, its easy-going, sunshiny demeanour unfolding from an African-style hook that could easily be from the pen of Abdullah Ibrahim (and Ford’s circular cymbal patterns which welcome back the leader towards the close are a joy). The perky, inquiring chromatics of My Instigation set up a more furtive mood as bass and vibes gingerly tread a path for the busy percussion of Ford. Following, We Were Meant To Be provides a glimpse of this saxman’s obvious world-at-his-feet potential with a firecracker that sizzles to the frenetic energy of all; and, as Eagles uses the lower end of his alto register so effectively, it begs the question as to how compelling he might also sound as a tenorist. 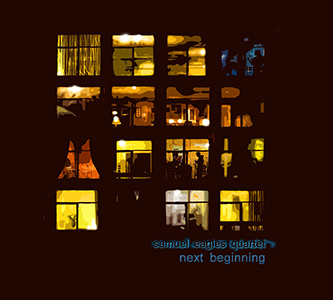 Title track Next Beginning closes the album – a beautifully upbeat, shuffling number which ‘final-curtains’ each member of the band, the leader proudly revelling in its ebullience. Released on the F-IRE label on 10 November 2014, the album launches at the Pizza Express Jazz Club, Soho, London on 16 November as part of the 2014 EFG London Jazz Festival. More live dates are shown below, and the quartet will also be performing at Jazz in the Round, The Cockpit Theatre, London, on 23 February 2015 – check out previous live video clips here. Recorded and mastered by Derek Nash.